Topics: Windows, Tilt And Turn, Casement, Sash & Case, Glass, and Doors. 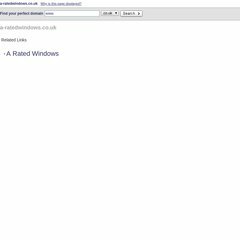 A-ratedwindows.co.uk's server IP number is 87.117.239.204. ns2.hfwd.co.uk, and ns1.hfwd.co.uk are its DNS Nameservers. It is hosted by B P Interactive Ltd (England, Newbury,) using Apache web server. PING (87.117.239.204) 56(84) bytes of data.